Warren Editions is pleased to present 2018’s Edition S, an etching by Wim Legrand, in collaboration with Zhané Warren. Legrand was born in Belgium, where he honed his skills as master printmaker. He lives and works in Cape Town, and is married to artist Jeanne Hoffman. While focusing on his artistic career, he runs a collaborative production space, Black River Studio; working with artists on fine art screen printing projects. To date, he has held solo shows in Belgium and South Africa and has participated in numerous group exhibitions across the globe. 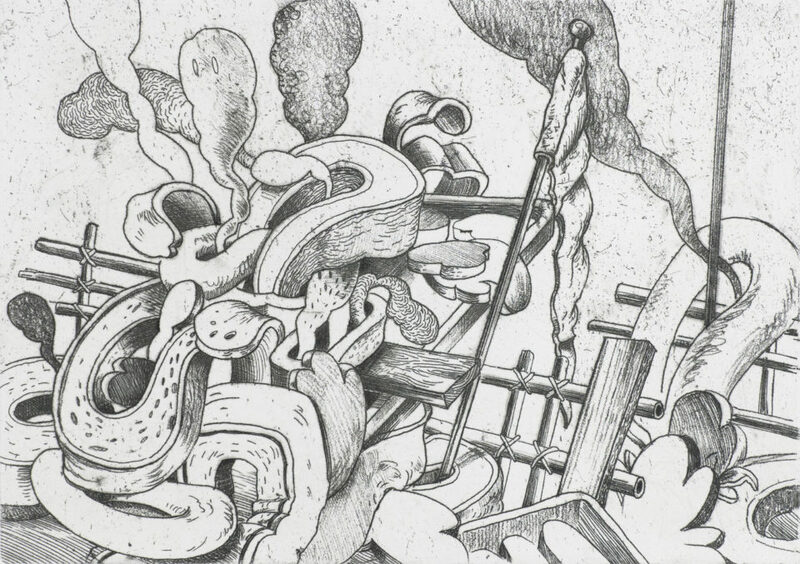 Legrand’s last three solo exhibitions were at 99 Loop Gallery in Cape Town. Legrand’s multi-disciplinary output offers a playful take on the paradoxical strangeness of everyday reality, while commenting on our postmodern condition as victims to the barrage of information and news feeds. Mundane and forgettable objects usher the familiar into peculiar allegorical narratives, where past blurs with present and fact with fiction – setting scenes in the unfettered “now” of a dream, meanings just out of reach and continually open to interpretation. He combines painting with drawing, cartoons and pop culture with aesthetic references to North European history painting and Surrealist traditions – the post-modern world overlaid onto the art historical atmosphere in which he was raised. These attributes are evident in his Trophy etching made for Edition S 2018. Edition S 2018 has been produced in an edition of 75 on Zerkall Intaglio 250gsm. Accompanying the edition are 5 Artist’s Proofs, 4 Printer’s Proofs, a Publisher’s Proof, Hors de Commerce and Bon à Tirer. Please phone Christo ahead of time to check if he is in the studio, sometimes he steps out to get a coffee or a bite to eat.